"The contemporary barn-like architecture is entirely appropriate for a Crematorium in this setting. 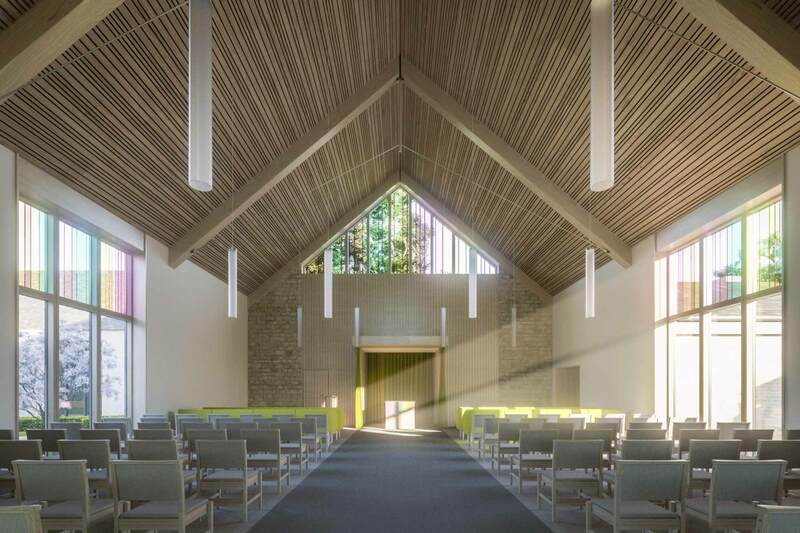 The light-filled interiors and well-proportioned courtyards provide attractive up-lifting spaces"
We were successfully appointed to design a complete new crematorium in Cheltenham, which included two chapels for 150 and 75 with all associated accommodation. The design needed to be highly sympathetic to the needs of the users and to have a very legible arrangement and clear circulation flows throughout. The architectural style references the local vernacular character of Cotswold Barns with natural materials used throughout along with attractive cloistered external reflection gardens and high quality landscape.